Pioneer Park is a huge 30 hectare multi-use complex under development in Gurgaon, India. Work started in 2009 but in late 2011, after a series of delays, developer Pioneer Urban Land and Infrastructure Ltd., called in contractor Urban Ecoinfra Pvt. Ltd, to take over building work from the previous incumbent. Charged with pulling the project back on schedule, Urban Ecoinfra made a number of changes, including bringing in a new management team, creating a new construction schedule and – most importantly – installing new tower cranes. By the middle of 2013, six Potain tower cranes were in place to replace the under-performing units which were removed. Five MCi 85 cranes and an MC 205 crane were chosen for the project and installed on the site of two luxury residential complexes, named Araya and Presidia, plus an associated retail and commercial building. The cranes were chosen for their speed and strength, features which allowed them to increase productivity. The Presida residential development consists of five luxury apartment blocks with a modern design that includes “sky garden” walkways around the innovative open-plan apartments. Two MCi 85 cranes were installed on this part of the project and both helped ensure that building work wrapped up at the end of 2014 when it reached its final 120 m height. On the Araya residential blocks Urban EcoInfra relies on an MC 205 tower crane with two MCi 85 cranes, including one that was dismantled from the Presida project and moved earlier this year. The Araya apartments incorporate contemporary styling and double height ceilings, and the tower will eventually stand 150 m tall. The cranes will be in place until the end of 2015. The three other MCi 85 cranes at Pioneer Park have all been working on the retail and commercial building, which is scheduled for completion in September this year. To ensure the highest levels of operating efficiency, Manitowoc Crane Care provided on-site training for all crane operators, while Amit Mahajan, deputy general manager of plant and machinery at Urban Ecoinfra, said that weekly and monthly maintenance programs ensure the cranes keep working. 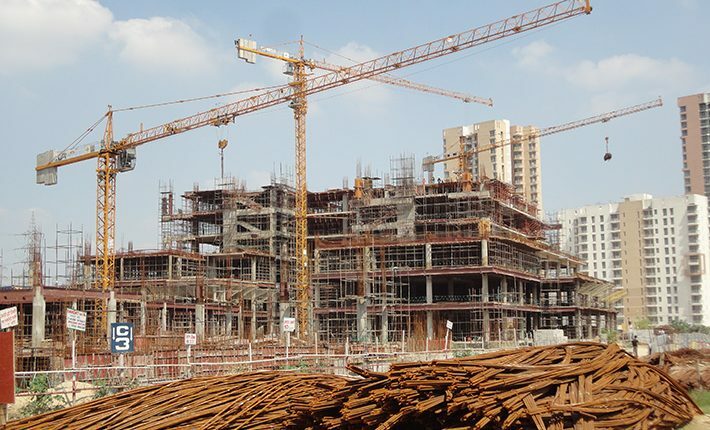 The 5 t capacity MCi 85 is the most popular Potain tower crane in India, and is built at the Manitowoc facility in Pune. It is designed for easy assembly and its strong load chart makes it a very versatile crane. When working with a 25 m jib the crane can lift 3 t at jib end and with its full 50 m jib it can lift 1.3 t at the jib end. The 10 t capacity MC 205 tower crane is designed to be easier to erect and dismantle. Two 5 m jib sections can be quickly combined into a single 10 m jib section for faster assembly. The jib length configurations can vary from 30 m to 60 m in 5 m increments. The jib end capacity at 60 m is 2.4 t.
The Pioneer Park luxury development will include a hotel, commercial complex and residences, and is located less than 8 km from central Gurgaon and 25 km from New Delhi. Pioneer Urban Land and Infrastructure Ltd., has been engaged in the development of real estate in Gurgaon for the last 25 years.